Grenoble is the centre of one of the very active and dynamic French metropolitan areas. With an extent of 4450 km2 and 311 municipalities, the Grenoble urban area had a human population of 769,593 in 2006. This area presents a large variety of physical and natural characteristics, resulting in contrasted heterogeneous landscapes. The region is structured by three mountain ranges: Vercors, Chartreuse and Belledonne, culminating at 2977m. The valleys of the Drac and Isere rivers favour urban sprawl, as well as the Bievre plain. The mountain areas benefit from a wide range of protection measures with 2 natural parks and several conservation areas. 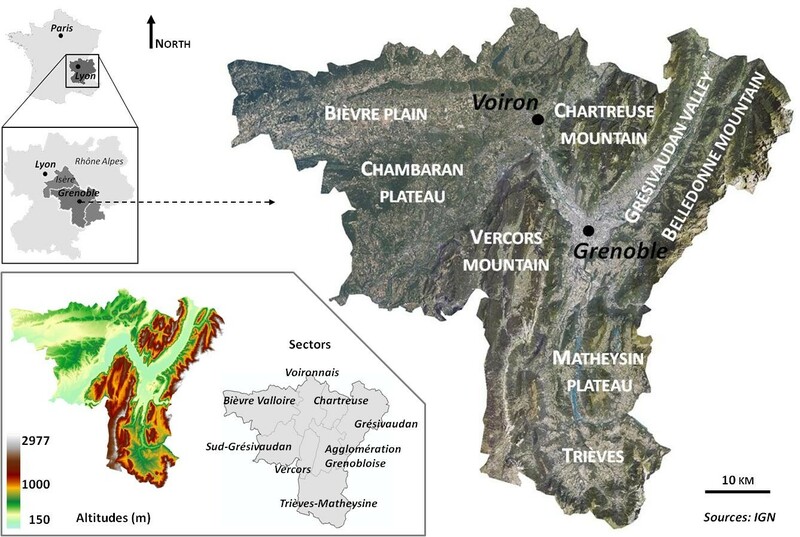 Analysing future land use trajectories and their effects on networks of biodiversity and ecosystem services for the Grenoble urban area. It will offer a better knowledge of mechanisms underpinning ecosystem services as well as analysing trade-offs and synergies between biodiversity, critical ecosystem services and territorial management. Further it will facilitate appropriation of tools and concepts by stakeholders and support the integration of the complexity of ecological functioning into debates on territorial planning and management. Focusing on territorial development, a topic of core interest for stakeholders, and especially at a time of development of a new plan. Improved awareness and operationalization of the ecosystem service concept. Enhanced coordination and motivation amongst stakeholders. Through this project an excellent interdisciplinary research team was funded including three PhD students and three postdocs. The methods developed for the participatory assessment of bundles of ecosystem services underpinned by causal ecological mechanisms, and for the participatory development and assessment of land use and ecosystem service scenarios, are of generic value for other sites with diverse landscapes, stakes and groups of actors and decision-makers. The scenarios considered are representative of current visions for Europe in general, and for its temperate and Mediterranean mountain regions in particular.